Is there any way you can improve working conditions? Yes. With the help of our social programme. Our social programme is geared at ensuring the Code of Conduct is adhered to, as well as improving working conditions across the globe. This includes facilitating safe, healthy workplaces in our suppliers’ factories, regulating working hours, paying fair wages, promoting the right to form unions, the freedom of organisation and to set tariffs, and eliminating all child and forced labour. Regular audits are carried out in our supplier companies. The results allow us to identify any needs for improvement. Supplies can only work for us when they submit valid audits proving they adhere to our minimum social standards. A Group database provides full transparency of a supplier’s status, meaning we can quickly identify any area that needs action. The following graphic provides an overview of the above process. We attach great importance to long-term partnerships and giving our suppliers the opportunity to grow, so we invest in a comprehensive qualification programme known as “EMPact”. 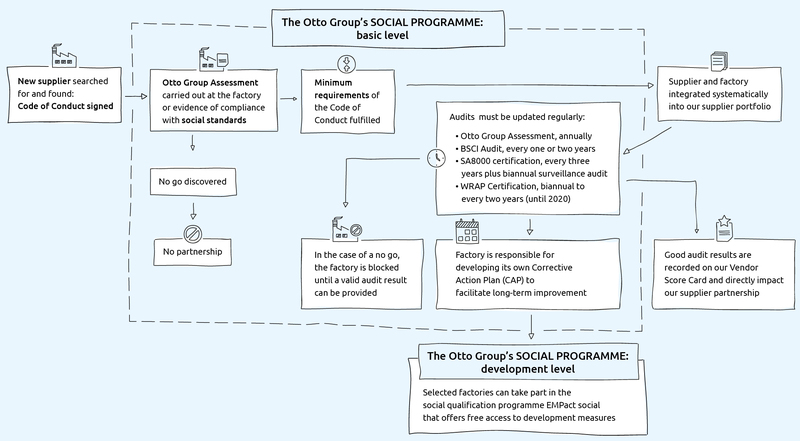 The Otto Group covers the costs of this eight-month programme aimed at enabling factories to understand the demands made of them and independently improve working conditions. Long-term, strategic partnerships with our suppliers are important because together we are stronger. By early 2018, around 240 factories had already completed our qualification programme. Click here to find out more about our supply chain management. 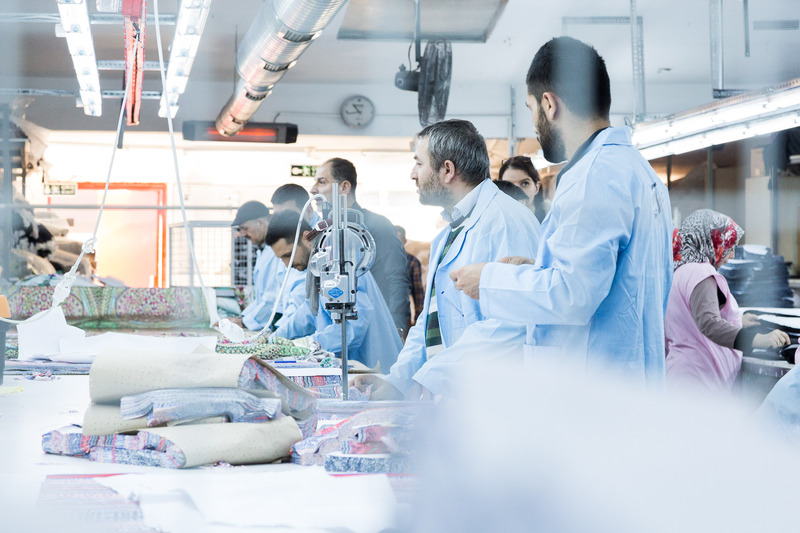 How do you check your suppliers’ working conditions? To raise social standards throughout our suppliers, we adhere to internationally recognised standards including BSCI (now known as “amfori BSCI”) and SA8000. The Otto Group, to which bonprix belongs, is a founding member of amfori BSCI which now counts over 1500 companies across the globe. In addition, the Otto Group has developed its own standard that can be applied to factories globally. Click here to find out more about the initiatives we belong to Memberships. Does everyone have to tow the line? Yes. We have a Code of Conduct. Anyone who wants to work with us has to follow it. When it comes to collaborating with suppliers and partners we have very distinct ideas of what we expect and some firm principles. Anyone hoping to work with us needs to share our beliefs. Our Code of Conduct is based on International Labour Organization conventions. Safeguarding human rights is one of our key universal principles. We want to provide safe, healthy working conditions for our employees. They should be entitled to regular hours, fair wages, and the right to form trade unions. We support environmental protection and anti-corruption policies in the workplace. But we can only achieve this as a team. Download our Code of Conduct to find out more.